I've written quite a lot of reviews in my trusty Clairefontaine notebook now. But what you don't know is the amount of times that I re-write a single review before posting it (hint: a lot of times, believe me!) So last week my beloved Clairefontaine notebook was full! That obviously made it necessairy to find a replacement that was at least equally good, and believe me, it wasn't easy! Luckilly we went to Amsterdam and Utrecht last week, which are two of the biggest cities in Holland, so I searched carefully, and I was really happy to find a Rhodia bloc (Because they don't sell those in Belgium!) A lot of fellow bloggers use these memo pads, which means they have to be good, so I bought one! And I'm really happy I did! At first, the A4 size looks a bit weird, as it is a bit taller than usual to compensate for the stapled top binding, so when you tear a single page of, it is still a full A4 page, pretty convenient! 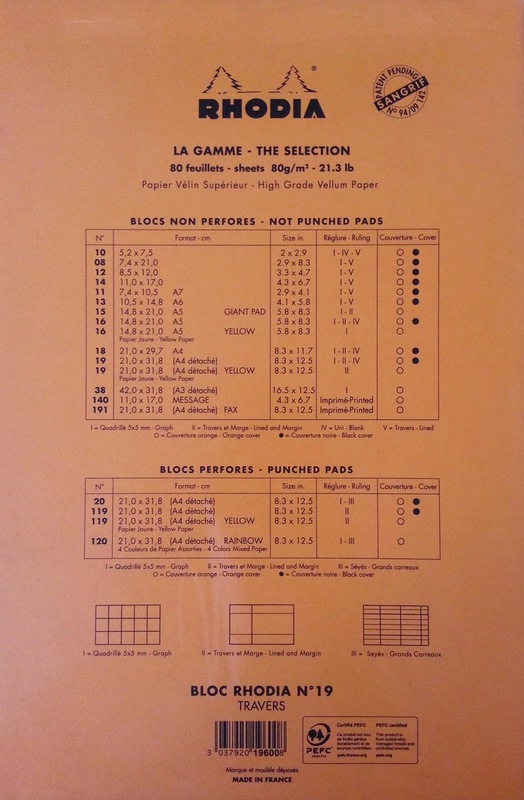 The bloc itself is made out of 80gsm paper (lined), and it has the typical Rhodia-orange cardboard cover. And on the back, you can find a lot of information about the different sizes and colours this notepad is available in. When you fold over the front cardboard cover, the paper is revealed. 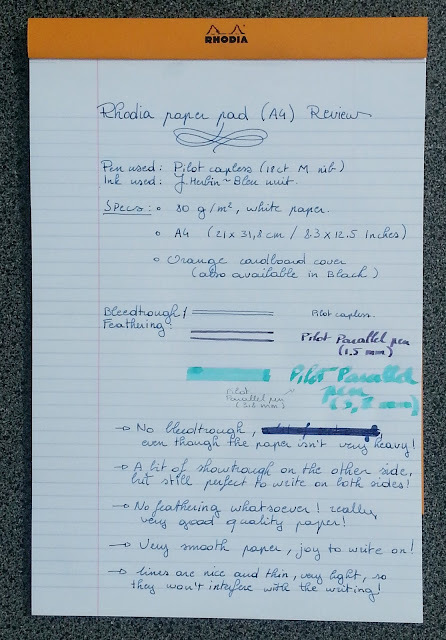 And the first thing I thought when I saw the paper: will that paper be thick enough when writing with a fountain pen? And the answer is: Yes, surprisingly it does. For school I use different, lesser quality 80gsm paper, which is horrible to write on with a fountain pen, because it bleeds through like crazy! But to my biggest surprise, this one didn't, it actually almost had no showtrough at all, even when writing with Pilot parallel pens! Very impessive! The paper is very smooth, just not as smooth as the Clairefontaine notebook. But it is still a joy to write on. Wet writing doesn't feather, it doesn't bleedtrough, and as I said before, it doesn't show trough either! So that's basically it! 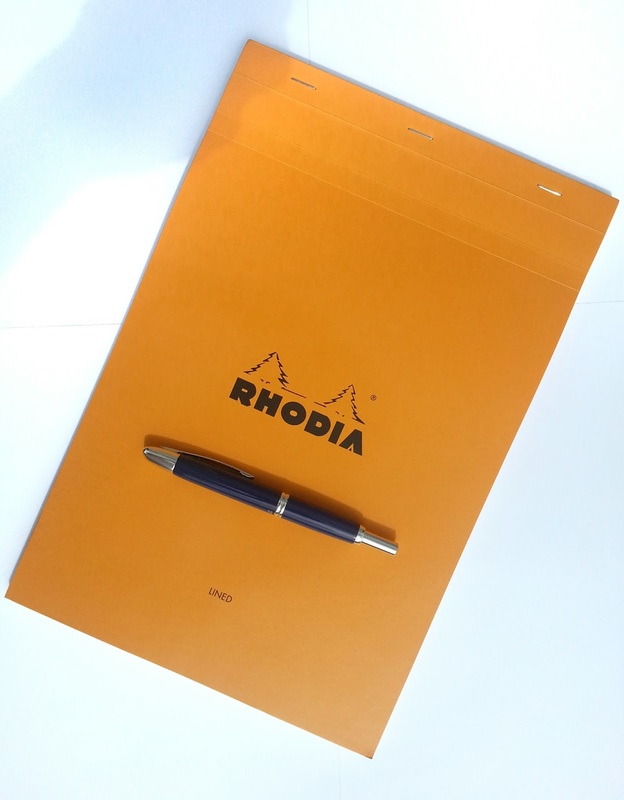 And of course, every review from now on will feature a written review on this lovely Rhodia paper! I love my Rhodia notebooks, especially with dots instead of lines! I couldn't find the dotpads, they only had the ruled ones :-( But it's still a great notepad!